If you are a South Florida resident, particularly of Miami, you are well aware of the city’s on-going, and seemingly never-ending, construction. In fact, construction all over the United States has been booming for the past several years, and 2017 is no exception. While cities like New York and Chicago have maintained their long-standing reputation as construction capitals, San Francisco, Los Angeles, and Seattle, are just recently joining the ranks. Although the increase in construction across the U.S. means more jobs and well-developed cityscapes, unfortunately it also means a higher chance of construction-related accidents and injuries. Common construction-related accidents involve falls, being struck by an object, electrocutions, and being caught in between equipment. The construction industry experienced its biggest loss in 2015 as fatal construction injuries rose by 2 % since 2008. The number continues to rise each year. Earlier this year, in May, a construction worker was hospitalized after falling three to four floors down a building shaft in Downtown Miami. Before that, one construction worker was killed and another injured after being hit by a Metromover car while on the job. 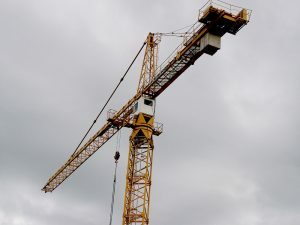 Then, on June 1, three construction workers in northwest Miami-Dade were seriously injured after two crane lifts fell. The specific cause of injury in all three incidents was undetermined. Another major cause of construction-related accidents are mobile cranes. Mobile cranes, unlike tower cranes, have approximately twelve to sixteen wheels, and are driven to and from the construction site. This creates an obvious risk, not only to the crane operators, but to those working at the construction site and to other vehicles on the road. Most mobile crane accidents involve rear end collisions, pinching, and mechanical failure. As a result, the Occupational Safety and Health Administration (OSHA) is constantly adapting the regulations for crane operation. Previous changes in the guidelines include a shift in liability from the crane operator to the entity providing directions to the mobile crane operator. OSHA is expected to release a new set of guidelines in November. There are a couple of different options when it comes to recovering from construction site injuries. The injured party can file a Worker’s Compensation claim with their employer, if the injury occurred during the course of employment. In the case of injuries sustained due to third party negligence, the injured party may file a personal injury lawsuit. Compensation for construction site injuries can cover medical expenses, lost wages, and pain and suffering. If you or anyone you know has suffered an injury while working on a construction site, and would like to have an experienced, established, and proven successful plaintiff’s attorney take a closer look at your case, call the personal injury attorneys at Friedland | Carmona now. The South Florida personal injury attorneys at the Friedland | Carmona, Jon Friedland and Michael Carmona, handle all types of negligence, product liability, personal injury, negligent security, slip/trip and fall, and car accident cases throughout the state of Florida, including; Boca Raton, Homestead, North Miami, South Miami, Miami Beach, Coral Gables, Pembroke Pines, Hialeah, Kendall, Aventura, Fort Lauderdale, and Palm Beach. Call the Miami personal injury attorneys today and let our family take the best care of your family.